I have now built Nishad's resin-moulded extruder parts (blog 24 August) into an extruder, fitted it in Darwin (thanks to the Really Useful new plug-in extruder swapper), and tested it. This gives us a way to make lots of extruder kits for people quickly. Zach is already sorting this out for the RepRap Research Foundation Online Shop. Watch that window! Any (material) cost estimates on this approach? Just curious ;). Handy that you can see inside it while it is working. My extruder produces a corrugated ribbon of swarf but I don't know exactly how. yeah, the clear factor is really awesome. i like that alot. 5 Kg of the resin costs about 30 GBP. The extruder weighs about 200 g.
We can make an even better window simply by puting a piece of sticky tape on the surface where the window is needed before we make the silicone mould. That eliminates the ridged surface of the underlying RP part. Nopehead - the swarf looks like a something a bit iffy happening between the screw drive and its bearings. Can you post pix of them? wow. that is really cheap. that works out to about $2.40 / set. the labor cost wont be much more, so this will dramatically reduce the price of the extruder kit. Off the present subject, (which is really promising,) but, are you upgrading the 'site and forums? Back on the subject. Will there be molded corner brackets and other hardware? I wouldn't be surprised if the corner brackets didn't lend themselves to this, but I can hope. i do believe they're working on getting moldings for darwin made. also, a side project i'm working on when i find extra time is a laser cut version of that really rad instructables CNC design posted in the forums a few days ago. that would be easily manufactured, and looked very easy to build/assemble/fix/etc. Just out of curiosity, how long does the resin have to set before you can strip the mould? i emailed adrian with some questions and he said something like 24 hours for room temp curing, and 3-4 hours for curing in an oven. That's going to be a lot of l-shaped trays. Does the plastic need to cure Before it's removed from the mold, or can it be allowed to partially cure, then be transferred to an oven for the rest of the process? If the latter, that's a lot more molds to juggle, and if the former, the pieces can be popped out, 'firm', and thrown in the oven en masse to be baked to 'hard'. Oh. If the former...that's probably a lot more initial parts to mold from too. Otherwise, you'd have second-generation casts, vying for rackspace in the oven alongside third-generation casts, and fourth-generation casts. I don't know how much accuracy you'd lose. Probably not enough to matter. The problem with pulling them out soft is that they can bend a bit. The moulds are happy in an oven; the silicone goes up to about 200 C.
Dents for drilling aren't enough, unfortunately. There's considerable internal void structure. But we are working on making cores out of polyethylene glycol, which is wax-like and can just be melted out in the oven. Your material costs would go down even further if you were willing to fill the resin with e.g. ground glass. I know this was mentioned with the thermoplastic materials, but it also works with thermosets, of course. Using filler affects the viscosity of the mix. So it sounds like given a set of moulds that you can make a set of parts every day, or, if you are willing to fire up your oven, several sets. My original comment has a link to the picture. The Full URL gets covered up by the edit box on the right but you can still select it and paste it into a browser. 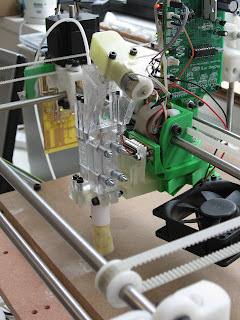 I have just found the RepRap website and so Hi to everyone. I'm currently doing some resin moulding and two good sources of parts/ information are UK http://www.tomps.com/shop/index.php and for US http://www.freemansupply.com/ these people also have excellent videos of all the different processes. When using a printed part from the dimension it's surface finish can be grealy inproved buy dipping or brushing the the item in MEK solvent this allows the surface ridges to disolve slightly giving a glass like surface. If dipping go for a start dip of about 5 seconds . You need a non stick surface to put it on to or a hanger. Give it a good shake as soon as it comes out. Think about which bit you hold onto as the tweezers you hold it with will leave a mark on the surface. Hope this helps.